Made in india with pure leather bag with embroidy work. Beautifully Hand Embroidered bag made from original Suede material to add an artistic touch to your fashion. This item is 7 color also. Description :Drawstring Bag, Hand Embroidered in Tribal mirror work, 100% Cotton.Roomy interiors lined in cotton. 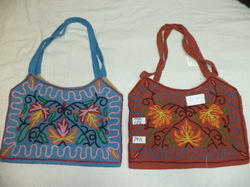 With enriched industrial experience, we have been able to offer a wide spectrum of Embroidered jhola Bag. The bag offered by us comes under the brand name of Ibaan and is designed by our creative designers, keeping in mind the latest fashion trend. Known for its attractive design, classy look and a smooth finish, our range of designer bags has earned a lot of demand in the market.